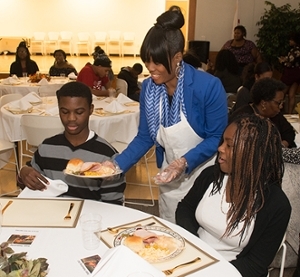 An afternoon of friendship and fellowship were the main items at Southern Illinois University Edwardsville East St. Louis Charter High School’s (CHS) fifth annual Thanksgiving Day Meal Celebration, Tuesday, Nov. 21 at the East St. Louis Higher Education Campus. Jamerson’s heartfelt remarks brought tears to his eyes and to several others in the crowd of about 120 CHS students, faculty, supporters and friends, including CHS Director Gina Jeffries. The main course was turkey, carved by CHS Assistant Director Willis Young. Also on the menu were ham, green beans, mashed potatoes, macaroni and cheese, cranberry sauce and rolls. A dessert reception, which included pumpkin pie, brownies, cookies and more, was held in the cafeteria in Building B. 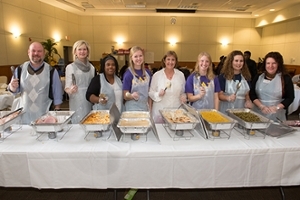 Some of those serving food to the students included Alison Reeves, PhD, associate professor in the Department of Educational Leadership and CHS executive officer; Mary Jo Pembrook, PhD, piano instructor at the SIUE East St. Louis Center for the Performing Arts Program; Kim Durr, chief of staff in the Office of the Chancellor; Wendy Brown, parent of CHS students Taylor and Emmanuel; and Rachel Gregson, Makenna Kuhl and Kara Brockmeyer, all members of SIUE’s Lambda Theta Chapter of Kappa Delta Pi (KDP) International Honor Society in Education. “There is so much going on today, and there are many challenges in life, but I want you all to take a moment and think of something that you are thankful for,” said Venessa Brown, PhD, associate chancellor in the Office of Institutional Diversity and Inclusion. The Charter High School, the school’s administration and each other were repeated responses from students who stood to give thanks. “I’m thankful for maturity,” said DeAmbra Loveless, who graduated from CHS in 2016. Loveless, who is also a sophomore at Lincoln University in Jefferson City, sang “He Wants It All” by Forever Jones. The SIUE Charter High School is a school-of-choice for families in the East St. Louis School District 189. The mission of the Southern Illinois University Edwardsville East St. Louis Charter High School is to prepare students who are career- and college- ready upon graduation. To achieve this mission, the school and its staff will positively impact the educational and economic lives of East St. Louis, Illinois youth through individualized instruction in core academic subjects, exploration of career interests and aptitudes, assistance in realizing students' talents, high academic goals, and expectations that graduates will become competitive employees for the 21st century. SIUE East St. Louis Charter High School Director Gina Jeffries, serve Thanksgiving Day meals to freshmen Tyreese Gomiller (left) and Nyasia Alls. 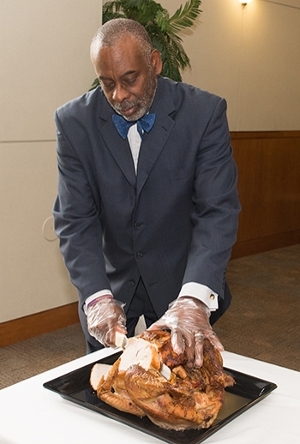 CHS Assistant Director Willis Young carves turkey for the school’s annual Thanksgiving Day meal. Ready to serve from left to right are: Colin Neumeyer, CHS English and Spanish instructor; Kim Durr, chief of staff in the Office of the Chancellor; Wendy Brown, parent of CHS students Taylor and Emmanuel; Makenna Kuhl, SIUE’s Lambda Theta Chapter of Kappa Delta Pi (KDP); Mary Jo Pembrook, PhD, piano instructor at the SIUE East St. Louis Center for the Performing Arts Program; Kara Brockmeyer and Rachel Gregson, KDP members; and Alison Reeves, PhD, associate professor in the Department of Educational Leadership and CHS executive officer.